He had been linked with a summer move to Premier League champions Chelsea as well as Manchester United. "Signing James Rodríguez was our coach Carlo Ancelotti's biggest wish," Bayern chairman Karl-Heinz Rummenigge said. "We're delighted we've been able to complete this transfer." Colombia captain Rodriguez, the top scorer at the 2014 World Cup, was signed by Ancelotti during the Italian's two-year spell as Real manager. 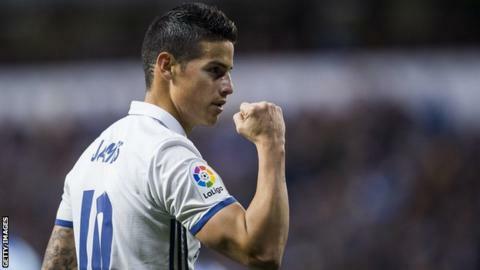 "James is a very versatile player. He's a goalscorer himself, he sets up a lot of goals and on top of that he's great from set-pieces," continued Rummenigge. "There's no question that this transfer further increases the quality in our team." The reality is that Alexis Sanchez was their number one target, and they couldn't quite make it work. James Rodriguez is a player with similar talents but doesn't really do as much as far as Bayern's needs are concerned. It's not a bad move for Bayern but it's not really the one they wanted. Having said that, he's still a big name and some people feel he has a lot of talent that can be brought to bear with the right management. Being a loan deal there's not a lot of risk for Bayern but it's not the big marquee signing everybody was craving. We have a pretty good idea of how much he's costing. There's a loan fee of 5m euros (£4.46m) per year and then his wages will be around 10m euros so effectively Bayern pay up to 30m euros if he stays for those two years and have an option to buy him for another 35m euros.